If you’ve ever taken I-81 north through Virginia, you’ve passed the town of Natural Bridge, in Rockbridge County—home to a ninety-foot limestone arch that extends over a gorge, a geological anomaly probably formed by an ancient underground river. Natural Bridge is an anachronism from the Route 66 era of highway travel, a place where you can pay twenty dollars to look at a rock, eat a rock-themed lunch, and then buy a shot glass illustrated with a picture of that same rock. As any respectable tourist trap must, the town hosts a constellation of other attractions: a petting zoo, a dinosaur/Civil War theme park, and the Natural Bridge Wax Museum (now closed, and former home to a ghoulish Obama tribute). Best of all is the featherlight, faux prehistoric monument known as Foamhenge. As its name suggests, Foamhenge is a one-to-one scale replica of Stonehenge, made of foam. It is identical to the original, save the flecked gray paint, the accompanying statue of a deadhead-ish Merlin, and the fact that it was erected several millennia later. 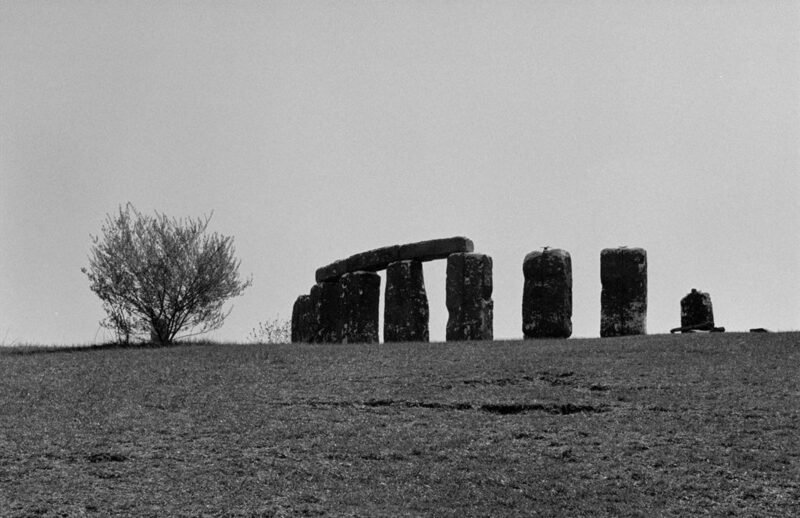 For the past twelve years, the henge has been the most public of Natural Bridge’s draws, garnering a steady stream of visitors and enough press to be mentioned in the same breath as the area’s actual ancient rocks. 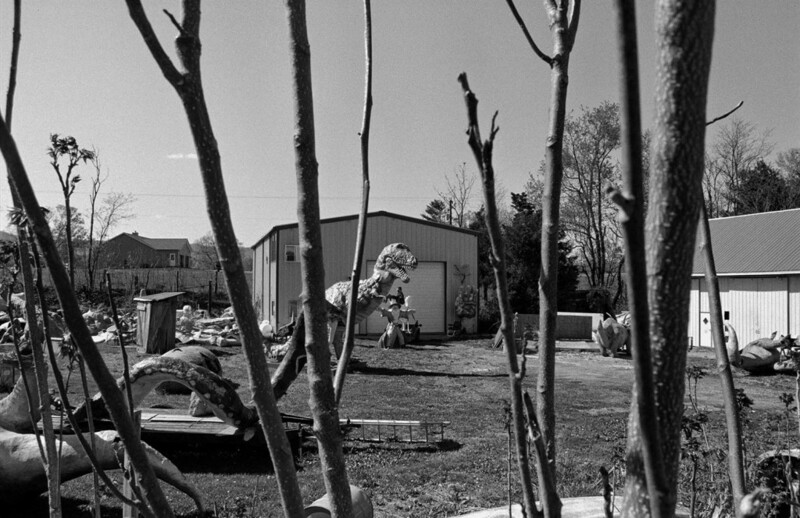 Its creator, an artist named Mark Cline, calls it his “foam-nomenon”: the unlikely culmination of his career as a sculptor of roadside attractions. Cline’s home base is an all-purpose fabrication shop called Enchanted Castle Studios. 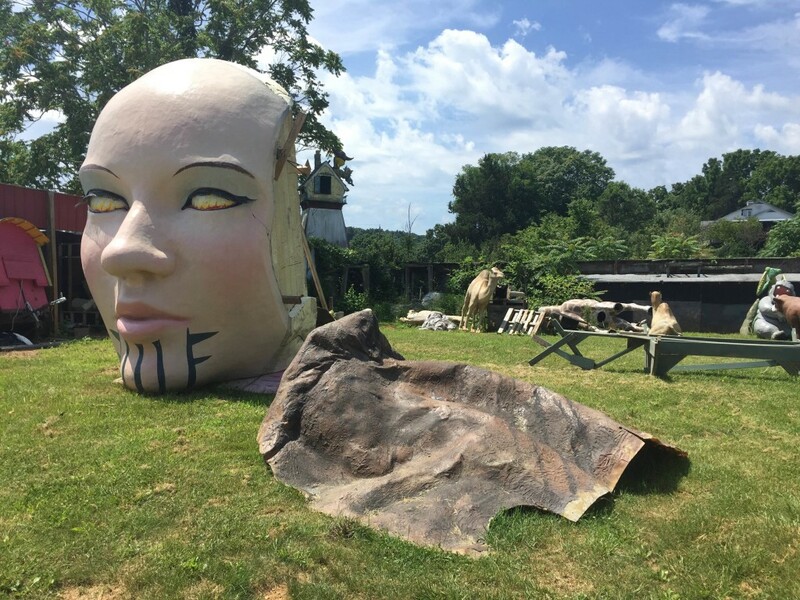 The front yard is full of Frankensteinian visions of 1970s Americana: a giant female head and a humanoid-hair metal gorilla coexist with boat-size ants and slime monsters. A mutant dinosaur stands harmoniously alongside a giant, Valhalla-bound chicken beast. The effect is more charming than scary—the monsters look friendly, familial. Cline says he builds them as a way for people to confront their fears. Cline is a handsome, slight man in his fifties. He moves like a guy who could perform a card trick without breaking eye contact. He speaks softly, in a tone that makes statements like “I’m worn out from building a giant albino dinosaur” seem reasonable. When I visited his studios, he was showing a family around the property—a teenage girl in Chucks and a DINOSAUR KINGDOM II T-shirt, along with her parents—but he directed me to his fabrication shop, where disembodied wax heads, salvaged from the old wax museum, lined the walls. 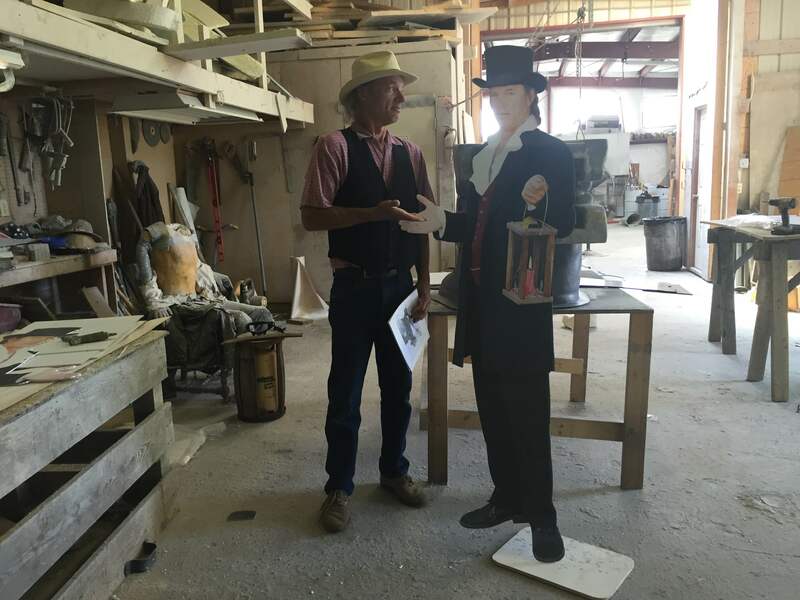 Cline’s assistant, Melvin, a powerful-looking guy with tribal tattoos, sawed a stand for a cardboard cutout of Cline, costumed as a magician. A pair of disembodied dinosaur claws lay ominously in a corner. In addition to Foamhenge and the Dinosaur Kingdoms, he’s behind a ghost tour, a magic show, an active prop shop that’s produced everything from Broadway set pieces to a giant skull for Alice Cooper, a defunct Monster Museum (apparently destroyed in a 2001 arson by fundamentalist Christians), something called “Cap’n Cline’s Pirate Adventure Ride and the Mummy’s Tomb of Doom,” a forthcoming mini-golf course, and an enchanted forest. His wife, Sherry, is the business mind of the operation. When we met, he showed me a picture of her on the brochure for his magic show, dressed in a red dress and looking slightly bemused. “She’s my Roy Disney,” he said affectionately. “Oh, that’s great!” said the teenager’s mom. And how did people react when they heard that Foamhenge could close? Cline got a lot of calls, but no suitable takers. He decided he needed to narrow his criteria. 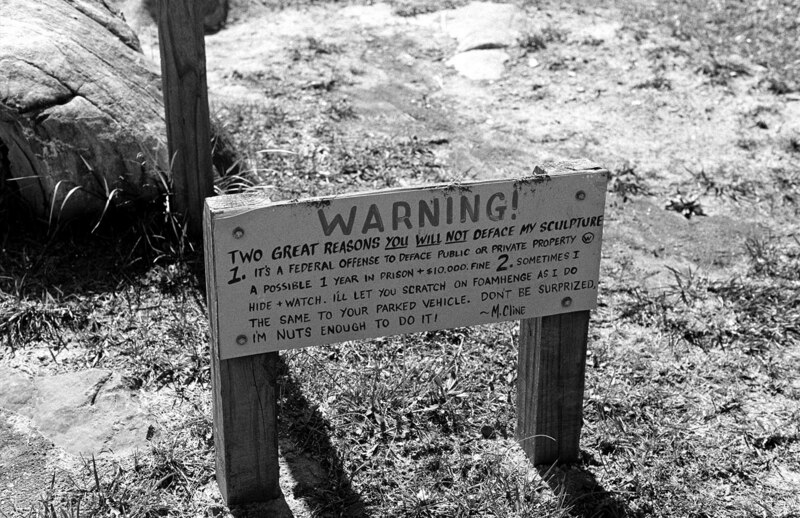 He wants Foamhenge to remain in the area, to drive business, to stay public, and to fit well on whatever land it eventually occupies. But he’s encountered a host of bureaucratic problems. One interested town is in debt from a golf course. Another didn’t want to pay for the installation. Cline said that it can be political. Nearby city councils apparently have a hard time justifying the installation and upkeep of a ring of giant foam blocks and a hippie wizard, no matter how timeless. “I tried to convince people in the state that it does well for the state,” he said. “But everything is a liability now. Some of them liked the idea but didn’t want to take responsibility for it.” As he spoke, he picked up an oversized straitjacket on a coatrack. I looked out his office window toward a yard full of beautiful liabilities. A boxy foam robot peered back at me through the blinds. The morning was getting late, so I said good-bye to Cline and headed toward Dinosaur Kingdom II, where I followed a winding path through a series of large tableaus: civil-war soldiers fighting tyrannosauruses, a man milking a cowlike dino, an ominous chapel, a long-necked animatronic beast stowed in a gimmicky outhouse. It was better than any mystery spot this side of the Mississippi. I bought a T-shirt and thought about what Cline had said about his work: how he hopes it’s a force for the good. I think it is. The park made no great claims for itself—an absurd revisionist history of the Civil War notwithstanding—but it offered a chance to get outside my head, to forget my daily concerns. I thought, instead, about the consequences of a run-in between a Tyrannosaurus Rex and General Ulysses S. Grant. A mile up the road, I climbed the hill to Foamhenge. Styrofoam has a half life of anywhere from five hundred years to forever, but it’s an inglorious forever: the henge could use a fresh coat of stone-colored latex paint, as could Merlin. 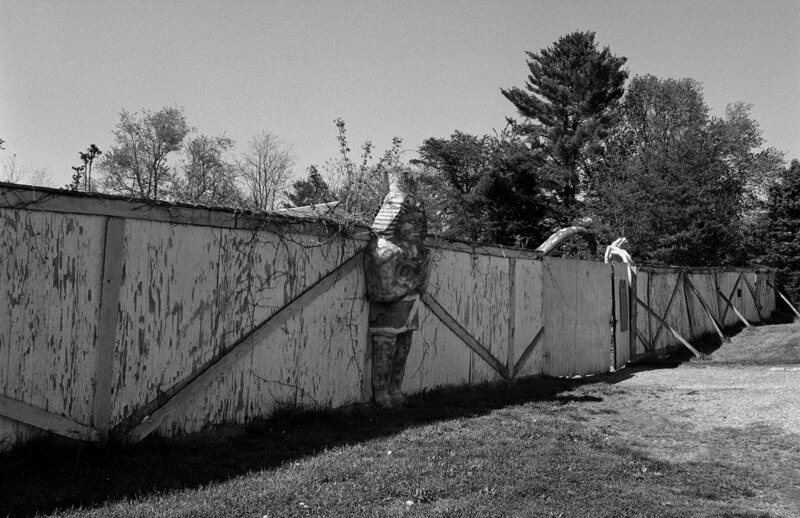 But no weathering could eclipse the weirdo joy of the place and its guardian. That morning, it was peaceful, a perceived reality transformed into an impossible scenario. Standing there, I felt as light as foam. Eileen Townsend is a journalist from Memphis, Tennessee. 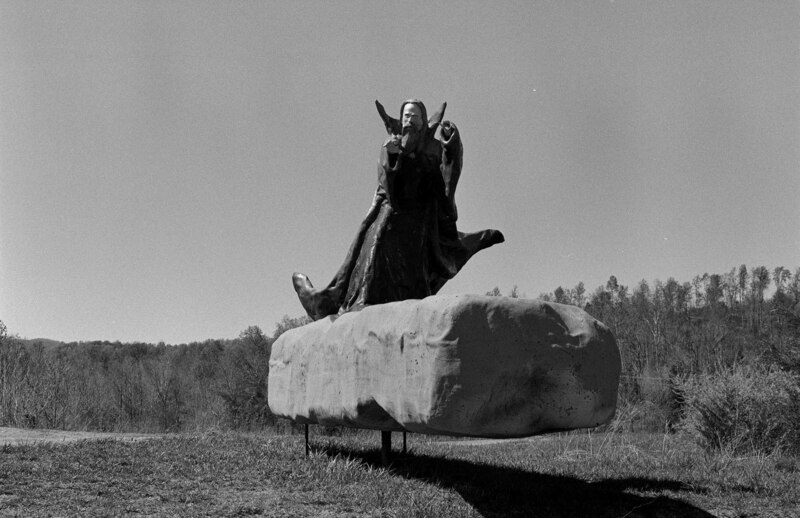 She writes about visionary art and the South.